, a learned English lawyer, the eldest son of Alexander Maynard, esq. of Tavistock, in Devonshire, was born thereabout 1602. In 1618 he entered as a commoner of Exeter college, Oxford, where, as we have often seen in the case of gentlemen of the law, he took only one degree in arts, and then went to the Middle Temple. After the usual routine of study he was called to the bar, and in 1640 obtained a seat in parliament for Totness. The part he took in the political contests of the day, procured him to be appointed one of the managers of the evidence against the earl of Strafford, and that against archbishop Laud. Yet in 1644 he was appointed, with Bulstrodte Whitlocke, at the particular desire of the lord chancellor of Scotland, and other commissioners from that kingdom, to consult with them and general Fairfax concerning the best method of proceeding against Cromwell as an incendiary between the two kingdoms. He was also one of the laymen nominated in the ordinance of the Lords and Commons to sit with the assembly of Divines, whose object was to establish the presbyterian form of church government in England. Notwithstanding this, we find him in 1647 opposing the violence of the parliament-army, for which he and serjeant Glynn were sent to the Tower; and when the parliament voted that no more addresses should be sent to the king, he told them that by such a vote they dissolved themselves. He even went farther, and after being secluded from his seat in the House of Commons for two months, he broke in among them, and | pleaded for the life of the king with such strength of reasoning, that Cromwell several times demanded that he should be brought to the bar of the House. His abilities, or that charm with which an independent mind never fails to conciliate its enemies, seem to have preserved him while thus apparently “serving two masters;” for in 1653, he was by writ called to the rank of serjeant at law; and in May of the same year was made, by patent, Cromwell’s serjeant. Here, too, his love of justice predominated, and he zealously pleaded the cause of a merchant of London, who had the boldness to oppose paying a tax imposed by Oliver without the consent of parliament. 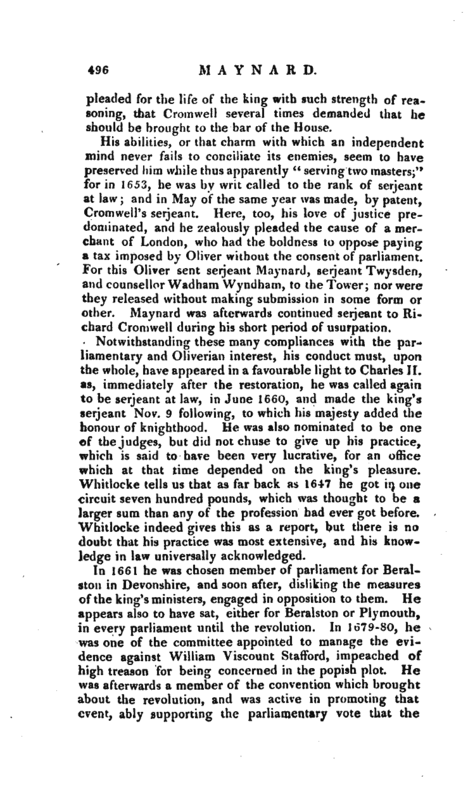 For this Oliver sent serjeant Maynard, serjeant Twysden, and counsellor Wadham Wyndham, to the Tower; nor were they released without making submission in some form or other. 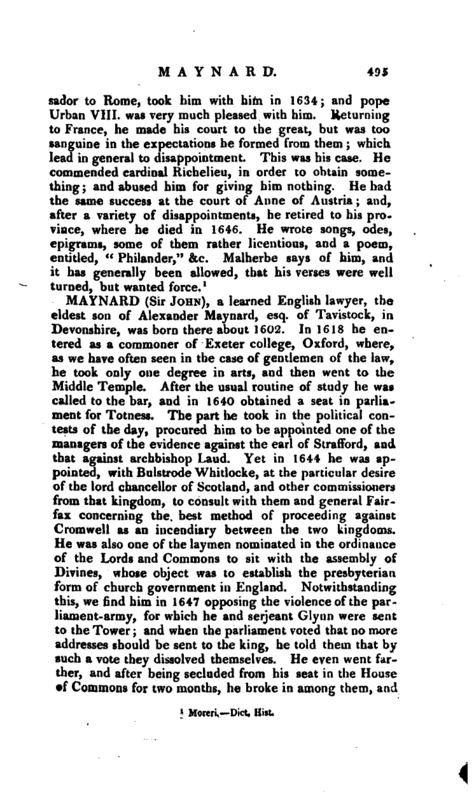 Maynard was afterwards continued serjeant to Richard Cromwell during his short period of usurpation. Notwithstanding these many compliances with the parliamentary and Oliverian interest, his conduct must, upon the whole, have appeared in a favourable light to Charles II. as, immediately after the restoration, he was called again to be serjeant at law, in June 1660, and made the king’s serjeant Nov. 9 following, to which his majesty added the honour of knighthood. He was also nominated to be one of the judges, but did not chuse to give up his practice, which is said to have been very lucrative, for an office which at that time depended on the king’s pleasure. Whitlocke tells us that as far back as 1647 he got in one circuit seven hundred pounds, which was thought to be a larger sum than any of the profession had ever got before. Whitlocke indeed gives this as a report, but there is no doubt that his practice was most extensive, and his knowledge in law universally acknowledged. In 1661 he was chosen member of parliament for Beralston in Devonshire, and soon after, disliking the measures of the king’s ministers, engaged in opposition to them. 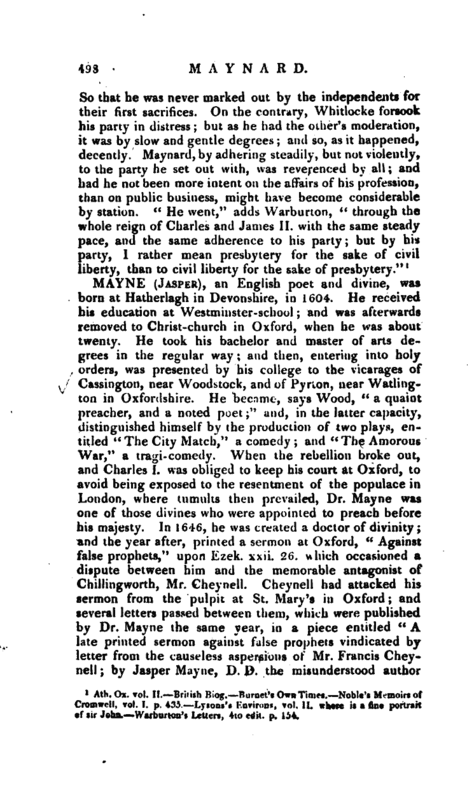 He appears also to have sat, either for Beralston or Plymouth, in every parliament until the revolution. In 1679-80, he was one of the committee appointed to manage the evidence against William Viscount Stafford, impeached of high treason for being concerned in the popish plot. He was afterwards a member of the convention which brought about the revolution, and was active in promoting that event, ably supporting the parliamentary vote that the | king had abdicated, and that the throne was thereby vacant.“He was now about eighty-seven years old, yet possessed his original vigour of understanding. Burnet has recorded a bon mot of his, on his first waiting on the prince of Orange, afterwards William III. which has been often repeated to his praise. 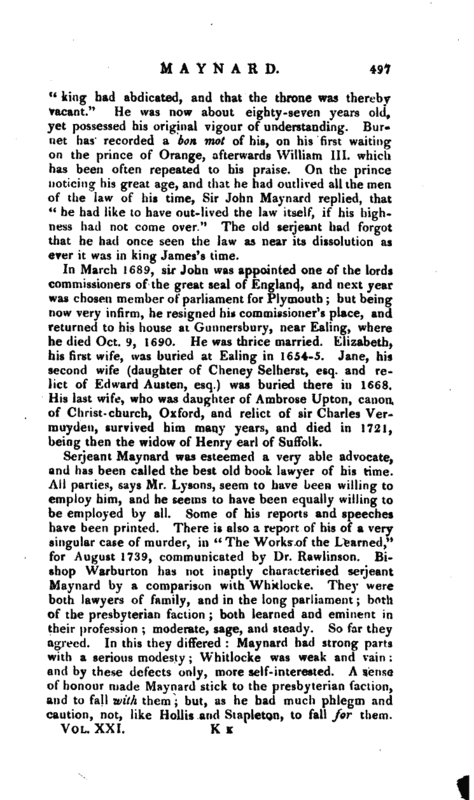 On the prince noticing his great age, and that he had outlived all the men of the law of his time, Sir John Maynard replied, that” he had like to have out-lived the law itself, if his highness had not come over." The old serjeant had forgot that he had once seen the law as near its dissolution as ever it was in king James’s time. In March 1689, sir John was appointed one of the lords commissioners of the great seal of England, and next year was chosen member of parliament for Plymouth; but being now very infirm, he resigned his commissioner’s place, and returned to his house at Gunnersbury, near Ealing, where he died Oct. 9, 1690. He was thrice married. Elizabeth, his first wife, was buried at Ealing in 1654-5. Jane, his second wife (daughter of Cheney Selherst, esq. and relict of Edward Austen, esq.) was buried there in 1668. His last wife, who was daughter of Ambrose Upton, canon of Christ- church, Oxford, and relict of sir Charles Vermuyden, survived him many years, and died in 1721, being then the widow of Henry earl of Suffolk. Ath. Ox. vol. II. British Biog. Burnet’s Own Times. Noble’s Memoirs of Cromwell, vol. I. p. 433. Lysotu’i Environs, vol. II. where i a fine portrait of sir John. Warburton’s Letters, 4to edit. p. 154.